Kinkakuji and Ginkakuji are two of the most famous temples in Kyoto. When people talk about the most amazing thing they saw, they almost always talk about their visit to Kinkakuji. Ginkakuji is usually not very important, when compared to Kinkakuji, however it is hard to mention one without the other. Both are visited, daily, by hundreds if not thousands of people. Both have a long history, however Ginkakuji was built after Kinkakuji and its final intended look has been debated for centuries. Kinkakuji was originally built in 1398 and had been rebuilt only once in 1955 due to arson. When approaching the temple, you are flanked by various tourist shops, but these tend to be less intrusive compared to the historical Kiyomizudera. The shops around Kinkakuji tend to be very subdued. This could partly be due to the fact that the route I used to enter the temple grounds had a large parking lot on one side. Upon entry into Kinkakuji, you are immediately presented with the main attraction, the golden pavilion. Kinkakuji literally translates into the “Golden Pavillion” and this pavilion doesn’t disappoint. It is built on one side of a lagoon and the entrance is on the opposing side. You will immediately walk to a small area on the side of the lagoon where everyone will be taking photos. On weekdays, you will more than likely see school children getting a tour of the temple grounds and “learning” about the historical importance of Kinkakuji. For most people, they will be distracted by the sheer beauty of the pavilion itself. Personally, I think it can be a little gaudy, especially in pictures, but when you see it in person, you will get very different perspective. The golden pavilion is very picturesque and it’s easy to get good pictures, even when it’s raining. The pavilion literally shines at all times, however a bright, beautiful, sunny day would be much better. Once you have finished the main attraction, a romp through the temple grounds behind the golden pavilion is a must. In fact, you have no choice as the exit is located on the other side of the temple grounds. You must head up a small hill behind the golden pavilion. This is where things change, either for the better or for the worse. In my personal experience, things only got worse, but I did make the most of the adventure. There are only a few things to see and do, but if it is your first time in Japan, it will be very interesting nonetheless. 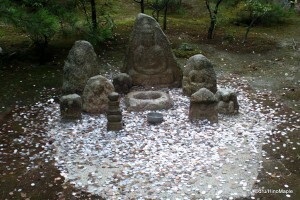 There is a small area behind the pavilion with statues where you can throw coins for good luck. It is a small section but unfortunately I couldn’t find any good information on exactly what you must do to get good luck. 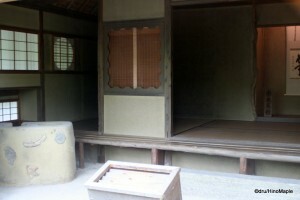 There is also a famous tea house and a power spot located near the exit. It’s difficult to describe the location but there is a seat where if you sit down, you will get good luck. Both the tea house and power spot are located in the same location. The tea house itself I’m not exactly sure why or how but it doesn’t hurt to try. 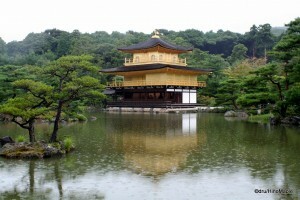 Kinkakuji excels the most because they have the golden pavilion. 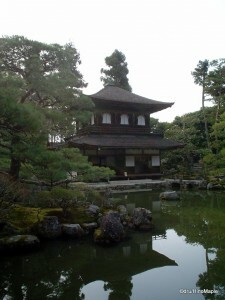 Ginkakuji, translated into the “Silver Pavilion” excels at everything else. 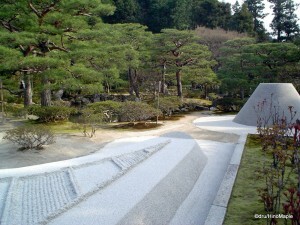 There is a path leading to Ginkakuji called “Philosopher’s Walk”. This is a cherry tree lined canal that stretches from Nanzenji to Ginkakuji. It is said to have inspired a famous Japanese philosopher as he contemplated life’s daily problems. When I visited, late February, it was anything but a philosophically enlightening path. It was a small path between homes with a small canal. The trees looked dead as it was still winter and the cherry blossoms had yet to bloom, or even begin budding. The path itself was just a typical gravel path and there was more garbage in the canal than I would have preferred to see. I spent a lot of time mocking the actual path, wondering why it was ever included in guide books. From my experience it was unimaginable to think of this path as enlightening until a few years after my visit. A few years after my visit to Ginkakuji, I had the opportunity to see pictures of this path and the temple during the cherry blossom season and during the summer. I was surprised to see the path was lined with cherry trees that covered the entire canal and it was a very beautiful place. It is something that I would like to see again if I ever get the chance as I’m sure that timing a visit to be outside of winter would be necessary to understand the reasoning behind the name of this path. Ginkakuji itself is also amazing. 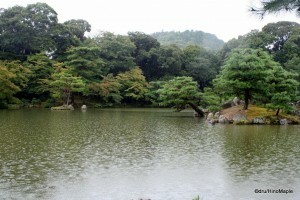 As I mentioned, Kinkakuji was all about the golden pavilion, but Ginkakuji is not about the silver pavilion at all. The pavilion was originally covered in a black lacquer that made it look silver during a full moon. The silver look was either from the moonlight or the waters from the gardens next to the pavilion. I have read conflicting reports on which one is true, however I’d imagine that both are actually true. The actual temple grounds are more interesting than the pavilion. The sand garden is the centre piece of the entire temple grounds. There is a large sand garden located near the entrance with a large conical shaped mound. The mound is called the “Moon Viewing Platform” and it is amazing at how perfect it looks. The design within the regular garden itself is also amazing and surprisingly tranquil. It has been a while since I had visited Ginkakuji so I can’t remember everything in great detail. I mostly remember my feelings and my emotions. I had just finished a very long hike during the day travelling from Kyoto Station all the way, including a side trip up a mountain and back down, on foot. It was literally a day hike through Kyoto and not something I would do again. It is, however, something that I wouldn’t trade in the world as the experience was unique and memorable. I was very tired when I entered Ginkakuji, but the tranquility of the temple and the beauty of the gardens helped invigorate me and I had the energy to return back to the station, again on foot. Both Kinkakuji and Ginkakuji are temples that should be visited. If you have to make a choice, I’d go with Kinkakuji due to the beauty of the pavilion itself. I would rather go to Ginkakuji if you were looking for something spiritual and uplifting. They both excel at different things and both are historically important. My memories of visiting both will never completely fade away and I will always have the emotions that I felt when I visited them. This entry was posted in Kansai and tagged canal, Cherry Blossom, Ginkakuji, Golden Pavilion, japan, Kinkakuji, kyoto, Kyoto-shi, Kyoto-to, Moon Viewing Platform, Nanzenji, Pavilion, Philosopher walk, Philosopher's Walk, sand garden, Silver Pavilion, tea house by Dru. Bookmark the permalink.